As the late Alan Thicke wrote, "You take the good, you take the bad, you take them both, and there you have The Facts of Life". Having created my Ten Best Films of 2016 So Far, now I turn to my Ten Worst Films to 2016. I fielded this list the same way I did my Ten Best: giving them a grade, then 'which would I rather'. Rules Don't Apply simply doesn't know what it is or wants to be. 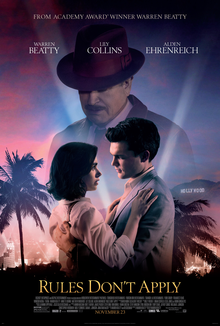 Is it a love story between two people inadvertently brought together by reclusive billionaire Howard Hughes? It is a Howard Hughes biopic that Warren Beatty has dreamt of making? Is it both? Is it somewhere in between? Sadly, the movie, despite good performances from Alden Enrenreich and Lily Collins, is a mess and bore, a hodgepodge of ideas thrown in with no sense of where to go. Many people were touting I Saw the Light as Tom Hiddleston's chance for a Best Actor Oscar, but the end result was so bad it was shunted off to 2016 to die a quick death. Now, I think that a.) 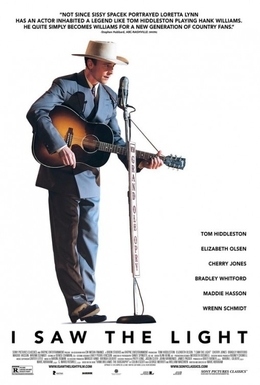 Hiddleston was pretty good as Hank Williams, Sr. and b.) this was a bid for him to get an Oscar nomination (a biopic being the best and easiest route for a man to get an Academy Award). However, Loki couldn't overcome a bad script and some awful direction that made I Saw the Light a jumble, with one never sure where one was in relation to the story. Slow and dull are two things one can never say about Williams' life, yet somehow I Saw the Light turned his life story into a confused snooze-fest. Twenty years too late, the sequel to Independence Day may symbolize all that is wrong with Hollywood today. It's a textbook example of what not to do. First, it wants to create a franchise on something that was not created to be one, taking all the goodwill Independence Day built and squandering it. Second, it caters to the foreign market, particularly the Chinese market, by giving major parts to Chinese actors and making the Chinese as a people highly important to the story. Third, it demolishes logic by bringing back a character from the original, even though the original strongly hinted that said character was dead. Fourth, it uses the same 'not-dead-anymore' character (obviously borrowing from the Steven Moffat School of Scriptwriting) to throw in a little political correctness by making said character gay. There's nothing wrong with having a gay character, but Resurgence spun this out of thin air and worse, didn't even have the courage to go all in with it. Fifth and finally, it has a naked call for a sequel that I doubt will come, making it look even sillier. It's just a dreadful, dreadful film. In the future, people will wonder what possessed two studios (Paramount and Metro-Goldwyn-Mayer) to remake (or reimagine) the movie that has won more Academy Awards than any in film history (tied with Titanic and The Lord of the Rings: The Return of the King). 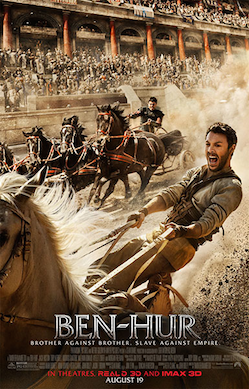 Even that, perhaps could be forgiven if Ben-Hur were any good. It isn't: a shambles of a movie, with motivation, character development, and acting all thrown away in favor of, well, I'm not sure in favor of what. All the performances were low-level (making Morgan Freeman's decision to appear in it all the more puzzling). The first remake is considered the apex of epic filmmaking, with even those who hate it acknowledging the brilliance of the chariot race. This version, however, going up against a legendary production, doubled down on hinting at it, with their version a weak, rushed, CGI-overdone version that lacked the thrill of the Charlton Heston version. Both the 1959 version and the original silent version will be remembered. The Millennial version won't, not even by the faith-based audience the film so nakedly called out to. I can't speak for my other Brothers and Sisters in Christ, but as an evangelical Christian myself, I can say this Ben-Hur sucked. A better title for this one would be Yawn of Justice, as this effort to create the DC Extended Universe to match the Marvel Cinematic Universe went from bad to worse. Featuring some awful performances (Henry Cavill alone is enough to sink any film) with the exception of Gad Gadot as Wonder Woman (who to be fair, has a fantastic theme), the film is a slow moving, dour, excessively long slog that takes itself too seriously. Oh, and did I mention how awful the performances were? Cavill is gorgeous, but a plank on screen, Jesse Eisenberg makes a fool out of himself (and gives the same performance he gives in every film he's in), and I still don't think Ben Affleck is a good Batman. The cameos for future Extended Universe figures were shoehorned in, and if we keep getting more films like Yawn of Justice, that Universe is going to implode. A film many critics loved, you couldn't pay audiences to sit through The Lonely Island's spoof of Justin Bieber. Popstar: Never Stop Never Stopping is essentially a Saturday Night Live skit expanded to feature length, and therein lies one of its problems. Too smug for its own good, it asks audiences to be fully aware of pop culture as these guys are. I barely recognized the TMZ spoofing, but to this day I still don't know who DJ Khaled actually is or what he actually does (apart from appearing in commercials as himself, which doesn't help). Popstar was rejected en masse by the public, getting pulled within two weeks from first-run theaters and one week in second-run theaters. 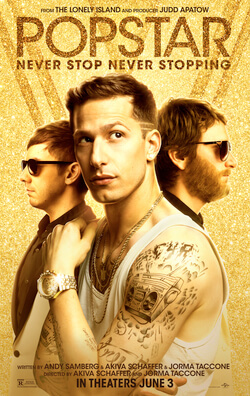 Popstar thinks its funny (and there are a few humorous moments in it, particularly the songs) but too much time is spent on juvenile thinking to make it really funny. Andy Samberg is around my age, and he's far too old to keep acting like he's around Justin Bieber's age (physical or mental, which I suspect is actually younger). Yes, I know many people loved Deadpool: its irreverence, its vulgarity, its self-awareness. I speak only for myself, but those were all the things I disliked about Deadpool, and there were more. I was appalled at the glee the film took in its graphic violence and cannot comprehend why so many parents took their children (some as young as Pre-K) to see it. They, in my view, have no discernment or discretion. I found it all too smug, too sleazy, too self-aware. I know I'm firmly in the minority on this, but a film that I had as the Most Overrated for the longest time appalled me rather than appealed to me. Again, we have a film that wants to start a franchise that no one wanted. 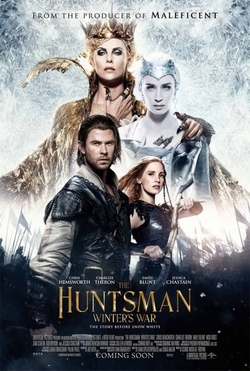 The Huntsman: Winter's War is a strange fit: part prequel to Snow White & The Huntsman, part sequel to the same film. Chris Hemsworth has yet to convince me he's an actor (and in a side note, his brother Liam pops up in another of my Worst Films of 2016: Independence Day: Resurgence. Coincidence?). That is bad enough, but to drag Charlize Theron, Emily Blunt and Jessica Chastain into this fiasco is even worse. There wasn't any need to make this film, save for a desperate effort to make money out of something and create a series so that studios wouldn't have to bother to make original films. A film with a background like Free State of Jones should be an exciting tale of a little-known bit of history, one that should be relevant to today's America. 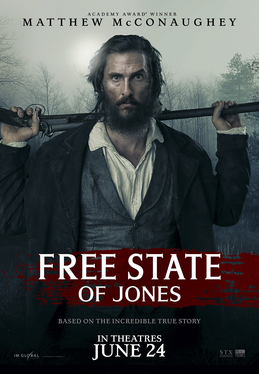 Instead, Free State of Jones is a slow, dull film, one that makes things worse by jumping back and forth between the 1860s and 1950s, so one never really sure which story is the actual story the film is trying to tell. Serious to a fault, Free State of Jones fails on all levels, taking a fascinating bit of American history and drowning it with dullness. It's one thing to make a sequel to a bad film. It's another thing to learn nothing about what made the original bad and find new ways to be worse than the original. 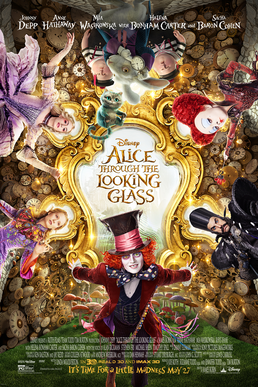 Johnny Depp's 'kooky' shtick has grown old and stale, and making The Mad Hatter the focus of the story is among the worst decisions Alice Through the Looking Glass made. Why should we care about his journey, and why make The Red Queen a somewhat sympathetic figure (and the White Queen a bit of a villainess)? Indulgent in its CGI, rushing through chaos in an effort to hide its shallowness, putting in a bit of timey-wimey (another lesson from the Moffat School of Scriptwriting), it has no charm, no joy, and no sense. Next Time, a Few Odds and Ends.